Figure 1: The subglacial eruption of Iceland’s Bardarbunga volcano (8-14-2014 to 2-27-2015) here shown bottom melting and punching through 1,500 feet of overlying ice. Note the ash covered glacial ice and airplane flying close to the eruption (Image credit Stoll.net). Recent geologic studies lend credence to the theory that geologic forces have a far greater influence on climate than the trace gas carbon dioxide. Here we break down how limited melting in three areas, Antarctica, Arctic Ocean, and Greenland, is being driven by geologically heated bedrock and not atmospheric warming. A just-released geological study by the University of Kansas (UK) has confirmed the results of three previous studies (see here, here, here, and here). All four of these studies concluded that geothermally heated bedrock is the dominant and likely sole cause of anomalous Greenland ice sheet melting. The UK study is especially convincing because it includes historical data, newly acquired data, and a very thorough analysis by a highly regarded non-biased research institution. The presence of Greenland bedrock geologically induced heat flow actually comes as no surprise because geologists and collaborating scientists have known for many years that an ancient mantle plume (shallow earth hotspot) was present beneath Greenland’s ice sheet. The UK study acted to prove that this ancient deep inner Earth-rooted mantle plume is still active and emitting vast amounts of ice melting geothermal heat flow. (Figure 2). Figure 2: University of Kansas sub-ice sheet geologically induced bedrock heat flow maps of Greenland. (Credit University of Kansas Research Study). Second, the Antarctic ice sheet: A just-released geological study by the National Aeronautics and Space Agency (NASA) has documented the presence of a 620,000-square-mile mantle plume beneath a significant portion of West Antarctica’s ice sheet (see here). This huge geological feature is currently emitting massive amounts of ice melting heat flow upward and onto the overlying ice sheet. The remaining portion of West Antarctica’s ice sheet lies atop 149 sub-glacial semi-active, active, or erupting volcanic features all part of the 3,500-mile-long West Antarctic Rift system (see here, here, here, here, and here). The numerical expression of the extent of Antarctic and Greenland ice melting relative to Earth’s area may help clarify the vast extent and significance of these geologically induced bedrock heat flow events. Antarctica and Greenland combined cover 11% (6,300,000 sq. miles) of Earth’s dry land. And finally, anomalous melting of Arctic sea ice is very close to being confirmed as geologically induced based on several schools of thought. 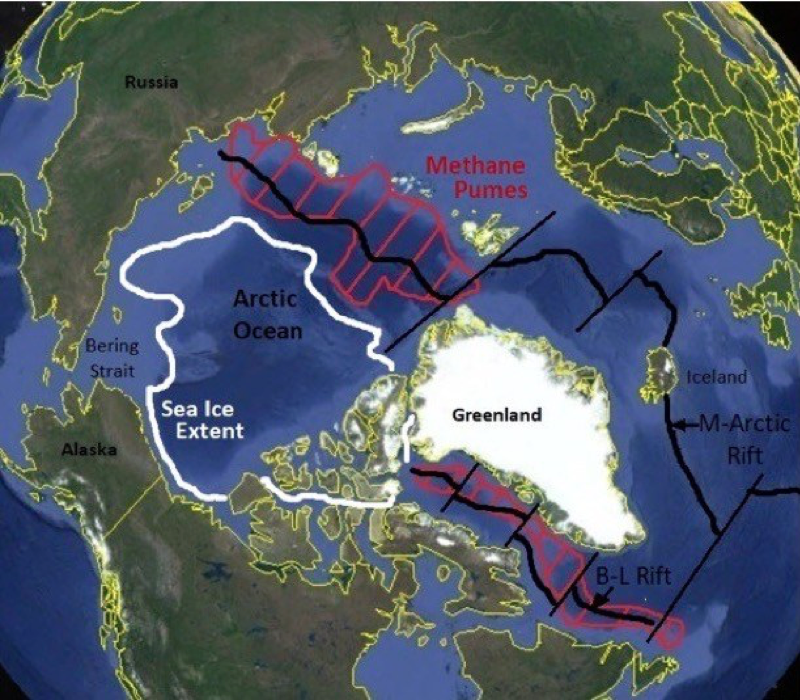 It is likely that Arctic sea ice is being geologically melted on two sides, east and west. Melting along the east side is the result of heat and chemically charged heated fluid flow the mid-Arctic Rift System (see here, here, here and Figure 3). It is important to note that melting of Iceland glacial ice cover is known to be related to volcanic heat flow fueled by the southern extent of the Mid-Arctic Rift System. Anomalous melting of the eastern extent of the Arctic sea ice is likely the result of ocean current-driven seawater inflow from the geologically warmed Bering Sea (see here and Figure 3). Figure 3: Two massive seafloor methane gas releases/plumes (red hatched) associated with heat flow from two oceanic rift systems (credit NOAA) and J. Kamis). Arctic sea ice adjoins and is part of the Greenland ice sheet (Figure 3). It follows that if geological forces are proven to be melting Greenland’s ice sheet, they are almost certainly also affecting the Arctic sea ice. It is now clear that changes in Earth’s atmosphere, man-made or natural, are not the singular cause of many anomalous climate-related phenomena. Due consideration should be given to other possible climate-altering forces, especially those of geological origin. Climate scientists, politicians, and worldwide media sources insisting there is only one explanation for anomalous changes in our climate-related events (global warming) need to help correct this obvious error in thinking. An excellent way for these folks to accomplish this would be their public announcement that persecution and prosecution of those advocating alternative explanations needs to stop. The validity of the now three-year-old Plate Climatology Theory has been significantly strengthened. Most importantly, geological forces are now proven to possess enough power to melt polar ice caps. This should have been obvious because we have known for many years, thanks to geologist Alfred Wegener, that geological forces have the power to move entire continents a significant amount each year!